What is it like to follow your intuition? I had an experience with that about 5 years ago. I was going to a camp in lower New York State in the Catskills Mountain range. To get there, I travelled down a day early and spent the night in a hotel just across the border from New York in the state of New Jersey. While I was in the hotel, I realized how close I was to New York City, and that I have never been there before. 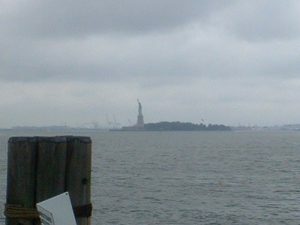 So in the morning, before heading to the camp I was to spend the week at, I spontaneously decided to go see the Statue of Liberty! I got some basic directions and started out. With that little bit of info, I was able to find my way into New York City and then to Lower Manhatten, then down to Battery Park. All the time I just knew that this was the right way to go. I did this all without any maps or any other directions. It was all done by following some internal nudges. 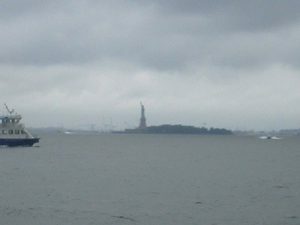 The day was a bit foggy and very overcast, but the fog had lifted enough that I could see the Statue of Liberty from the park. It was just a neat experience. Spent a few moments and took a few photos before leaving. Without a map, just following the nudges, found my way out of the city. After I got out of the city and back on the open highway, I drove into a heavy rainstorm. 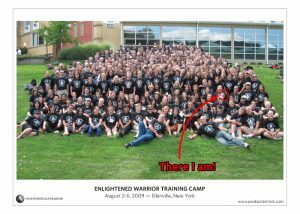 From there, through the rain, I was able to find my way to the camp. For this part of the drive, I did have maps because this was planned out ahead of time. It was really a neat experience. It is not normal for me to take a drive that is not mapped out. But to do so and not get lost, but to feel guided all the way — it was totally amazing! If you have ever had an experience of your own where you have followed your intuition, please share it as a comment below.